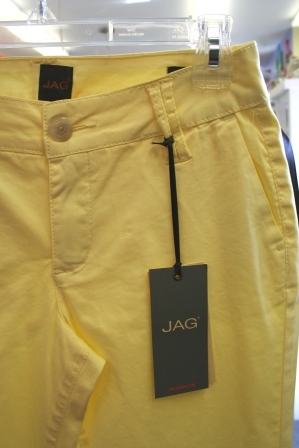 You will fall in love with Jag Jeans when you try them on. The fit is fantastic! We carry a wide selection from full length denims to crops, capris and shorts, in an array of colors and fabrics. Donna picks up these colors in her designs for great combinations. Bright, fun, comfortable and affordable resort-wear , I Can Too garmets are great for the beach and everyday life. From shirts to capris, they are great for a stroll along the beach or park. They are made in the U.S.A. too! These designs are meant to move you comfortably and stylishly through every part of your life. From the office, to dinner with friends, book club to college reunion, these clothes are the ones you can truly live in. Every piece can be dressed up or down, accessorized or stand on its own. These clothes are sure to be the favorite core pieces in your wardrobe. For pure, cozy comfort, Eucalyptus can’t be beat! Donna mixes her paints to match the palette of great summer colors that we offer in both crop and capri pants. In season, we have as many as 10 colors to choose from. Lulu-B clothing is made to form expression of one’s identity, it is functional, fun, colorful and most of all comfortable. Making functional clothing that enables their customers to pursue their interests in style is what keeps them up at night and what wakes them up in the morning. All For Color is a bright and colorful collection of fashion apparel for women of all ages. Fun, vibrant colors and prints that can be dressed up for the evening or dressed down for everyday use.